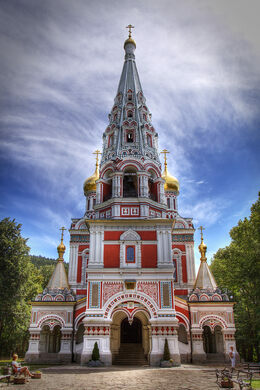 Tucked away in a tiny town in the slopes of Bulgaria’s Balkan mountain range, hidden within a thick grove of trees, is the Shipka Memorial Church. Flitting in and out between curtains of leaves are the shimmering golden onion domes and Russian Orthodox crosses—tell-tale giveaways of the church’s Russian architecture; it is also known as the Russian Church in Shipka and the Memorial Temple of the Birth of Christ, and as part of the larger Shipka Monastery. 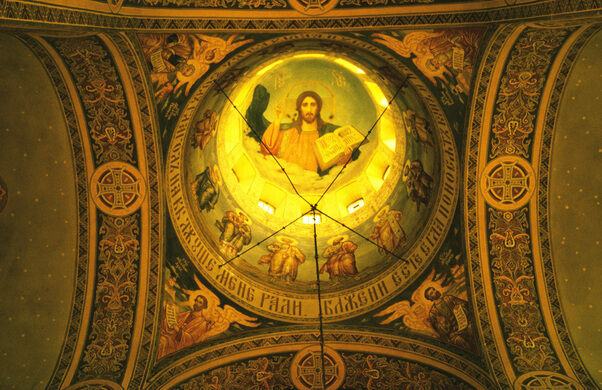 The church, which is now Bulgarian Orthodox, was built between 1885 and 1902 in the 17th century Muscovite style, complete with friezes, arcs, and pediments. The building is dedicated to those soldiers—Russian, Ukrainian, and Bulgarian—who lost their lives fighting to free Bulgaria in the Russo-Turkish War from 1877-78 and more specifically, the Battles of Shipka Pass fought between the Russian and Ottoman Empire. The Church officially opened on the 25th anniversary of these battles, with the names of fallen soldiers inscribed on walls within and their remains held in stone sarcophagi in the church’s crypt. The church has a bell tower rising 174 feet, with bells cast from battle cartridges weighing up to 12 tons. 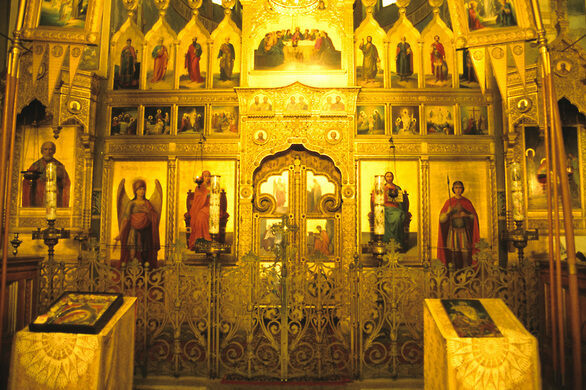 The church’s exterior is stunning, especially experienced in its remote and isolated mountain setting, while the interior is decorated with gilded ornamentation and intricate paintings. 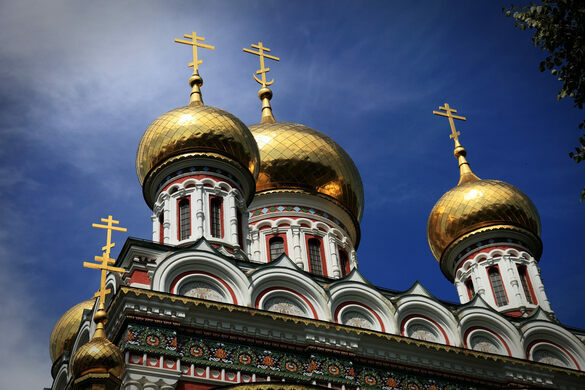 Shipka Memorial Church is a perfect destination after a long meander up and around the trails in Shipka Pass, where many soldiers sacrificed their lives. From farther down the mountainside, the church’s gilded domes are hidden—yet still glitter in the distance. There are direct buses from Plovdiv and Stara Zagora. From Sofia, there are bus and train options that run on the hour or half-hour; you can first to to Kazanlak and transfer from there to the No6 bus. 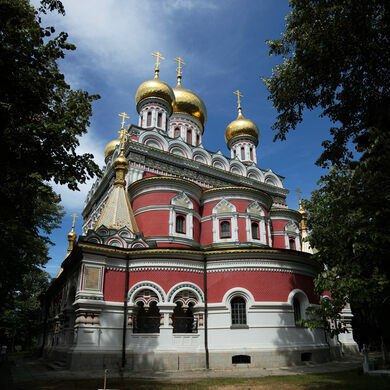 The Shipka Church is also along the route of a number of mountain trails that also go to Shipka Peak and Buzludzha Monument. If you drive, there is free parking at the church. The church is open from 8:30am to 5:30pm. In respect of church traditions, visitors should wear clothing that covers their shoulders, elbows, and knees; women should have scarves in order to cover their heads.